It’s probably for the best that President Trump forced retired Lt. Gen. Michael Flynn to resign as national security adviser when he did. That’s because Flynn would likely have found himself in another scandal — in addition to the one involving his phone calls with Russia’s ambassador — over a $530,000 lobbying contract he had with a company linked to the Turkish government. Flynn disclosed a slew of details about that lobbying contract this week in documents filed for his firm, Flynn Intel Group, with the Justice Department under the Foreign Agents Registration Act. The meeting, which occurred while the Turkish officials were in town for a United Nations General Assembly meeting, was organized by Ekim Alptekin, the sole proprietor of Inovo BV, the Flynn Intel client. The Daily Caller first reported in November, just after the election, that Flynn Intel Group had a lobbying contract with Inovo BV, which is nothing more than a shell company registered in the Netherlands. The relationship was puzzling because of Alptekin’s position as head of a business group with connections to the Turkish government called the Turkish-U.S. Business Council. An op-ed that Flynn wrote for The Hill on Nov. 8, Election Day, was also peculiar given the timing of the piece and Flynn’s rhetoric. Flynn staked out positions in the op-ed he had never before expressed publicly. He expressed support for the Turkish government, an Islamist regime, and was heavily critical of Fethullah Gulen, a Muslim cleric in the U.S. whose extradition is sought by Turkey’s president, Recep Tayyip Erdogan. 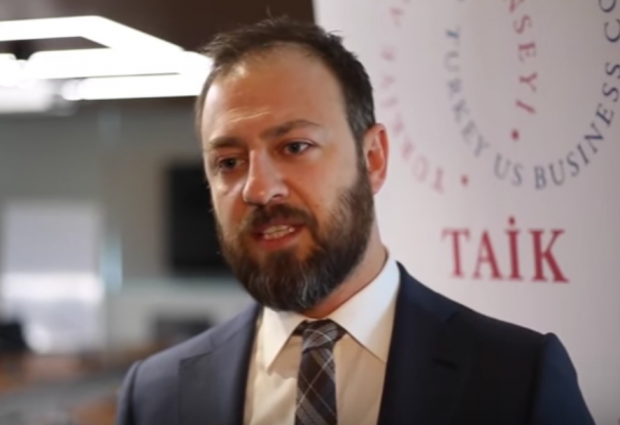 Berat Albayrak, one of the officials who met with Flynn Intel Group, is Erdogan’s son-in-law. Flynn’s new filings undercut some claims that Alptekin made about the lobbying relationship in November. For his part, Flynn remained silent about his lobbying work. “He must have really wanted to do that, because anyone that had his best interest in mind would advise him not to,” Alptekin said in a phone interview at the time. 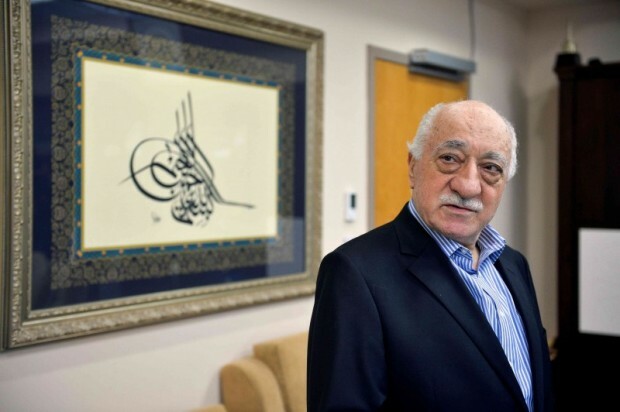 And while Alptekin is openly critical of Gulen, he said that the relationship with Flynn Intel had nothing to do with the 78-year-old cleric, who lives in a compound in the Pocono Mountains. Instead, Alptekin claimed that he sought Flynn’s help with a natural gas company based in the Middle East. Nowhere in the FARA filings is work for the company mentioned. Undercutting Alptekin’s denials is a letter Flynn Intel’s lawyers at the firm Covington & Burling sent to the Justice Department on Tuesday. “Attending this meeting on September 19, 2016, in New York, were the Minister of Foreign Affairs and the Minister of Energy, to the best of Flynn Intel Group’s current understanding,” reads the disclosure. It is perhaps that link between Alptekin and the ministers, Cavusoglu and Albayrak, that compelled Flynn Intel to file the FARA disclosures. The decision to file the FARA documents also comes as Flynn grapples with fallout from conversations he had in December with Russia’s ambassador, Sergey Kislyak. President Trump asked for Flynn’s resignation after he misled Vice President Mike Pence about the nature of those conversations with the Russian diplomat. The Turkish government has hired U.S. lobbying firms to assail Gulen over a network of charter schools operated by supporters of the cleric. Erdogan desperately wants the U.S. government to extradite Gulen, so much so that his regime has labeled the cleric a terrorist. Alptekin did not tell TheDC whether the Gulen issue was discussed in the meeting between Flynn and the Turkish government officials. But it was broached in a meeting held between a Flynn Intel Group partner and a member of the House Homeland Security Committee in October. According to the FARA filings, Bijan Rafiekian a Flynn Intel partner who owned 33 percent of the firm, met twice in October with Miles Taylor, the national security adviser on the House Committee on Homeland Security. One meeting was in Taylor’s office, the other at Flynn Intel Group’s offices in Virginia. “Over the course of the discussions, Mr. Rafiekian raised the firm’s representation of Inovo and issues related to the research conducted for Inovo concerning Mr. Gulen and Turkey,” the filing states. Rafiekian is identified in Flynn Intel Group literature as Bijan Kian, a businessman and former director of the Export-Import Bank. According to a source familiar with the topics discussed in the meetings, the first meeting was held under the auspices of a defense technology developed by Kian’s company, GreenZone Systems. The second meeting involved discussions about GreenZone but then pivoted to a discussion about Gulen. The source says a group of men were brought into the room by Kian to discuss Gulen and what they said was his “shady” network of charter schools. The source said that committee staff were put off by the approach. 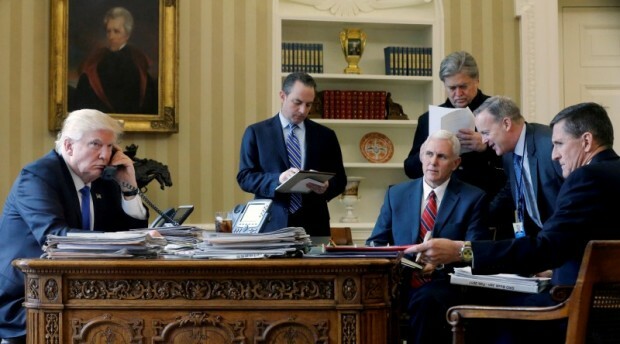 Flynn was not present during either meeting, according to the source. Flynn Intel’s work for Inovo also involved a massive public relations effort. In addition to the op-ed, the firm planned to produce a documentary about Gulen based on its research. Independent contractors were hired, and former CNN news anchor Rudi Bakhtiar was paid $1,200 for an interview. Flynn Intel forked out $40,000 to SGR, LLC., a public relations firm, to help disseminate to documentary, which never came to fruition. SGR also placed Flynn’s op-ed with The Hill, the disclosures reveal. And while Alptekin vehemently denied knowing about the op-ed before it was published, Flynn Intel’s filings say otherwise. “Nonetheless, the op-ed addresses subject matter related to the research that Flynn Intel Group conducted for Inovo, and a draft of the op-ed was shared with Inovo in advance of publication,” the documents read. While the filings say that Inovo BV did not have a hand in writing the document, Flynn Intel submitted it to Inovo/Alptekin before publication for feedback. “No changes, other than technical edits, were made to the op-ed based on feedback from Inovo,” the filings state. In previous interviews with Alptekin, he made no mention of having seen the op-ed prior to publication. He also claimed in one interview that his payment to Flynn Intel was in the “tens of thousands” of dollars. But he told TheDC on Wednesday that he did see the op-ed prior to its release but that his warnings against publishing it were not taken into consideration. Despite those inconsistent statements, Alptekin maintains that he has been consistent. “Everything I told you before is 100 percent accurate,” he told TheDC. He also confirmed that he paid much more than the “tens of thousands” he previously claimed to have shelled out to Flynn. He said that the initial contract called for a $600,000 payment for three months of work. Alptekin negotiated that figure down to 75 percent of the initial amount, he said. “I have always been truthful and transparent, but I agree with my legal counsel that this FARA filing is flawed and will consider whether I have legal ground to object against it,” he told TheDC. As for the meeting with Flynn and the Turkish ministers, Alptekin said he “merely introduced them,” knowing that all were in New York City. He said that they met Flynn in his capacity as the former director of the Defense Intelligence Agency and “not as a [Flynn Intel Group] officer to discuss Inovo’s work. “Gen. Flynn did not direct the Ministers to anyone working for the US government,” he said, adding that Flynn’s plans to write the op-ed were not discussed. A month after that meeting, Flynn attended an event with Halil Mutlu, a cousin of Erdogan’s and the former director of the Turken Foundation, a U.S.-based charity that focuses on Turkish issues. The Gulen issue was discussed at that meeting. The new FARA filings also explain the origins of a mysterious infographic created that Flynn Intel requested of SGR, the public relations firm, to smear Gulen. Infographic from Denny Rehberg’s op-ed in The Hill. SGR declined to comment on the matter. In its own filing, SGR says that it did not disseminate the graphic to any outfit but Flynn’s. And in its filing, Flynn Intel says it only disseminated the graphic to Inovo BV. That would suggest that Inovo BV passed along the graphic that ended up in Rehberg’s article. Alptekin acknowledged that he was aware of the graphic before it was published but that he did not share it with Mercury. He also said that the graphic was not discussed in Flynn’s meeting with the government officials in September. Efforts to reach Bakhtiar, former members of Flynn Intel, and Rehberg were not successful. 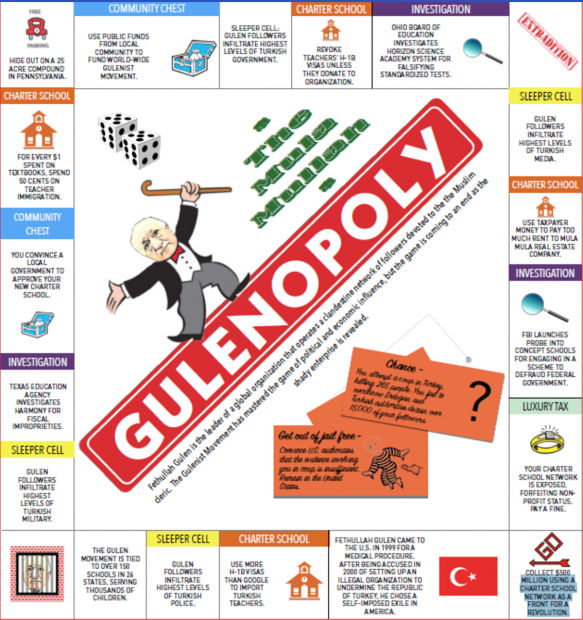 Update: Alptekin told Politico in a recent interview that he did, in fact, give the “Gulenopoloy” graphic to Mercury LLC. Alptekin said that he sent the graphic to Mercury partner Morris Reid “as kind of a funny thing.” Alptekin said he knew Reid through his work for the Turkish Heritage Organization, a U.S.-based non-profit. Reid declined a request from TheDC to discuss the graphic.